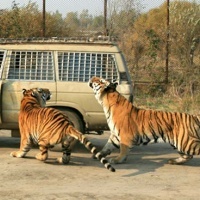 Tiger watching is perhaps the most exciting activity which can be appreciated in Harbin. 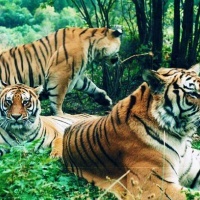 Manchurian Tiger Park (aka Siberian Tiger Park) is the one and only place left for the world to admire some purebred and scarce Manchurian (Siberian) tigers, one of the world's 10 most endangered animals. Covering an area of 1,440,000 square meters, the Manchurian Tiger Park is situated on the Northern bank of Songhua River and adjacent to the famous Sun Island. The park consists of five sections: Adult Tiger Garden, Adult Tiger Breeding Garden, Tiger Cub Garden, Lion Garden and the Walking Area. In the park, tourists can feed the tigers with meat even take photos with them. 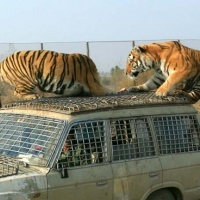 In addition, some protected tour cars also cage tourists to linger through the fierce animals to appreciate the adventurous and exciting scene. Usually, it takes more than 1 hour to finish the whole visit. I will be on my own. Is there a tour to go to the Sun Island Park and then to see the tigers? If not... How far are the tigers from Sun Island park, and how do I get there on my own without a car? Finally, how much does it cost to go to the Ice and Snow world, then to go in a caged car and feed the tigers, and how long is the visit? Thanks. Hi Ripple, u mentioned moon bay ski resort nearby the sun island..is this ski resort good? any detailed info? eg. price, facilities, distance from harbin city centre.? Hi Linda,the tiger park is about 30 km from the Harbin Taiping International Airport; the nearest ski resort is Moon Bay Ski Resort (near the Sun Island); If you visit the park, you can live in Zhongyang Dajie(Central Street), where the hotels are about 4.5- 4.9 km from the park. How far is this from the Harbin Airport - I am on transit for 2 days there , is this near any ski resort or hotel?